Research in Social Stratification and Mobility continues its tradition of publishing the best and most innovative research on the changing landscape of social inequality the world over. This issue focuses on different dimensions of social closure and their relationship to social inequality processes, including the changing role that education plays in sorting people into favorable and unfavorable labor market positions across a global diversity of cultural settings. This issue also examines the fluid boundaries of race and ethnicity in contentious political settings, relationships between attitudes and collective action, and the role that technology and political context plays in promoting economic development and well-being. These topics and the research methodologies they represent display the vitality of social science research dealing with social stratification and the wide array of methods, contexts, and policies that directly affect the life chances of most of the world's peoples. 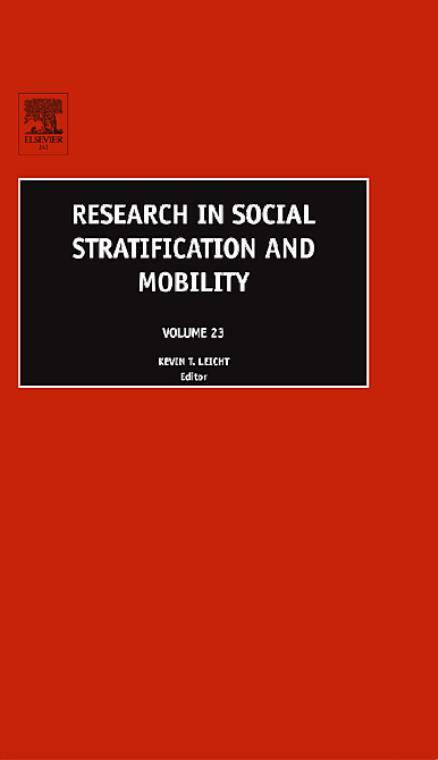 This issue also marks a continuation of the ties developed between RSSM and the Social Stratification and Mobility section of the International Sociological Association (RC-28). This collaboration promises to promote and disseminate social inequality research throughout the world through an established network of distinguished international contributors and commentators. Introduction. (K.T. Leicht). Education, Social Closure, and Social Mobility. Education, Employers, and Class Mobility. (M. Jackson, J.H. Goldthorpe, C. Mills). Recruitment into the Eastern European Communist Elite: Dual Career Paths. (E. Hanley, D.J. Treiman). Participation in Work-Related Education: Variations in Skill Enhancement Among Workers, Employers, and Occupational Closure. (D.B. Bills). Educational Assortative Mating in South Korea: Trends 1930-1998. (H. Park, J. Smits). Class and the Educational Attainment of Siblings: An Explanatory Model of Social Mobility. (Yi-Lee Wong). New Insights on Ethnic Stratification in Israel. Ethnic Stratification and Place of Residence in Israel: A Truism Revisited. (I. Adler, N. Lewin-Epstein, Y. Shavit). On Ethnic Categories for Research in Israel: New Data on an Old Issue. (A. Khazzoom). Perceptions and Collective Responses to Inequality. Public Attitudes to Economic Policy in East and West: Efficiency, Subsidies, and Public Ownership. (J. Sikora). Perceived Image and Utility of Collective Action Organizations Among U.S. Physicians. (T.J. Hoff). Productivity, Technology, and Economic Inequality. Relative Deprivation, Efficiency Wages, and Labor Productivity in Taiwanese Manufacturing Industries. (J. Liu, A. Sakamoto). Minimum Wages and Income Inequality in the American States, 1960-2000. (T.W. Volscho Jr.). Wiring the World: Access to Information Technology and Development in Poor Countries. (Y.W. Bradshaw, K.M. Fallon, J. Viterna).